ControlEng: SERVOsoft News: SERVOsoft® v4.1 Released! SERVOsoft® v4.1 Released with a Long List of Enhancements! For highlights of the v4.0 release, see here. For all release details, see the Revision Log. We now have all manufacturer versions using v4.1. The newly enabled Manufacturer versions are BAUMUELLER, BONFIGLIOLI, PARKER, and STOBER. Improved support for Double Layer Capacitors (DLC), and added I2t overload model capability to all Energy Storage Modules (ESM) and Expansion Modules (EM & DLC). Many more enhancements were added, as well as 3 sample projects with detailed supporting Project Notes explaining the key points of each sample project. Working closely with Michael Koch GmbH, ControlEng developed a detailed model to size KOCH Dynamic Energy Storage Modules, including DES, DEV and DEK modules, as well as DSM 4.0 and Super Capacitors. Now users can name Power Groups for more customization. 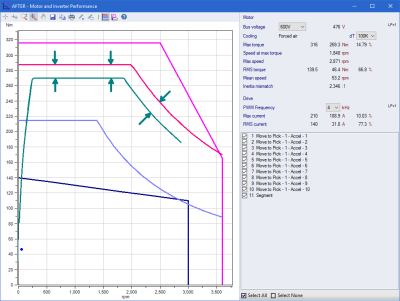 And in the Treeview, right-click and Disable Power Calculations for any Axis/Slot for scenario analysis. When one or more axes/slots are disabled, the power calculations are not considered for those axes/slots. This allows for a very quick way to see how a system performs with and without say a Capacitor Module and/or Energy Storage Solution. But it can also be used for sizing various gearboxes and motors for the same axis, and seeing which provides the best fit wrt energy consumption or any other design criteria. Added support for up to 3 motor brakes in 1 motor record. And now users can define the motor brake On/Off control in the Sequence. Added support for Radial Load Force at Crank and connected Gearbox output. Added "Rolling Resistance Coefficient Lever Arm" and "Wheel Flange and Slide Friction" selection tables. Tip: By using the Optimizer PRO's Curve Fitting on the Cart mechanism, users can determine the absolute maximum acceleration and deceleration ramps with specified margins for the Wheel No Slip force. The ADVANCED and PRO versions allow up 9 and 50 axes, respectively. Both the ADVANCED & PRO versions support up to 3x Infeed, 3x Capacitor and 3x Bleeder modules per Power Group. And the PRO versions adds support for multiple Power Groups. The Optimizer PRO continues to improve, and now adds the 'Motor Peak Torque Margin' target, along with support for 'complex splines' with up to 3 different profile types in one spline. The Optimizer PRO now works at both ends of the drive chain. As before, it works at the load by working with the motion profile. And now in v4 we have added Curve Fitting where the Optimizer works at the drive, motor, gearbox, mechanism, and then generates the motion profile. The SERVOsoft® database continues to grow with frequent updates, and now contains over 125,000+ products! Click here for a summary of the current products in the database. If you are a vendor and want to add your products to the SERVOsoft® database and/or are interested in the Manufacturer Promotion Version, please contact us.